An example of Tengwar writing. Tengwar is a constructed writing system, invented by J. R. R. Tolkien. The tengwar is used in his fictional world Middle-earth, for example the book The Lord of the Rings. In the Quenya language, tengwar means "letters", tengwa is the singular and means "letter". The tengwar are used to write some of Tolkien's constructed languages, like for example the elven languages Quenya and Sindarin. But Tolkien used the tengwar mostly for writing English. Because the tengwar is an alphabet, it can be used to write almost any language. In the late 1910s, J. R. R. Tolkien developed the script Sarati, which was already a bit similar to tengwar. The tengwar were probably developed in the late 1920s or in the early 1930s. 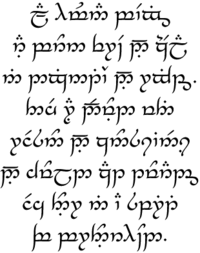 The first published sample of tengwar writing was 1937 in The Hobbit, to so-called The Lonely Mountain Jar Inscription. The full explanation of the tengwar was published in 1955 in Appendix E of The Lord of the Rings. The tengwar table, with the names of individual tengwa. 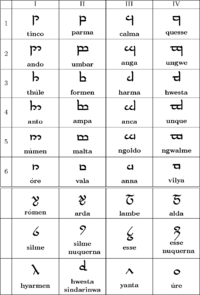 The tengwar have a certain order, and are usually shown in a table/chart. They are sorted by how they look, which is also connected to how they sound. Because it is an alphabet, every tengwa means a sound. The main tengwar letters are placed into four vertical series (témar) and six horizontal rows (tyeller). There are different ways to write with tengwar, which are called "modes". Between these modes there are differences, sometimes only a few and sometimes many differences. In different modes, the tengwar sometimes mean different sounds. In some modes the tengwar are used for vowels and consonants; and in other modes the tengwar are only used for the consonants, and the vowels are marked by signs above or below the tengwa, as in abugida writing. These vowel signs are called tehtar ("signs"; singular: tehta, "sign"). There are different modes to write the different Middle-earth languages. People have also made new modes to write English and other modern languages with the tengwar. The tengwar is written in a table/chart with the way the letters sound. For example, if the sound comes from the front of the mouth it is in 1 row. Each column is for the sounds that come from the nose, throat, or lips. Tolkien used the tengwar to write texts for his fictional world Middle-earth and other things. He used it to write in the languages he invented (for example Quenya and Sindarin), but also used the tengwar to write English. After Tolkien's Middle-earth books became famous, people also got interest in his languages and writing scripts. The tengwar are used by fans to write new things, or to re-write existing texts with tengwar. This page was last changed on 14 April 2019, at 13:40.